What is more badass than wearing a real fossil tooth of the Megalodon, the most terrifying predator ever to inhabit Earth’s oceans around your neck? 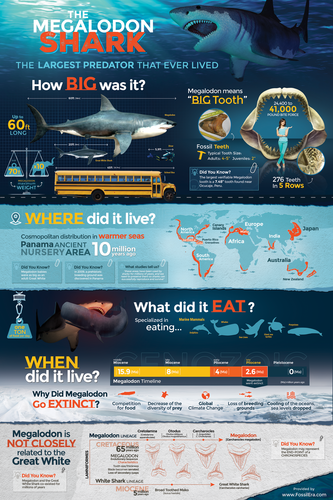 A full-grown, adult Megalodon shark could reach incredible sizes of up to 60 feet long. Just imagine a metro bus with six inch teeth! Juveniles though had much smaller teeth, often only about two inches in length. Megalodon sharks replaced their teeth frequently during their lifetime as they grew or became worn, and shark teeth fossilize pretty easily, so these smaller teeth are surprisingly common fossils in some areas. These juvenile Megalodon teeth can be collected in many regions of the Eastern United States ranging from Florida up to Maryland. FossilEra.com has a wide selection of these small Megalodon teeth that have been wire wrapped and turned into awesome Megalodon tooth pendants and necklaces. Prices start at about $25 and most are less than $50 depending on the tooth size and quality. Now you can show the world who the real apex predator is.